Happy Saturday! We’ve been in celebration mode for hubby’s birthday this weekend, so this will be a random, all-over-the-place post. 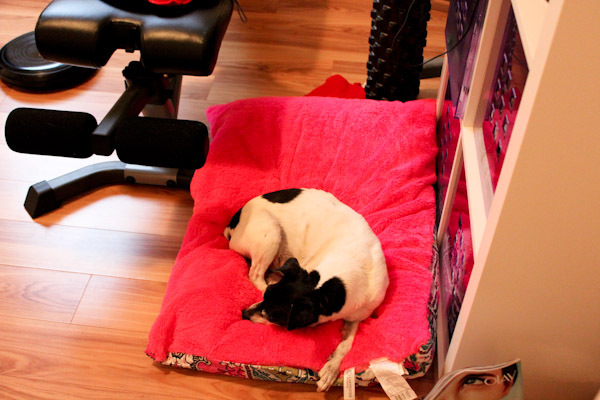 I took yesterday off work to make it a 3 day weekend of fun and relaxation and had a nice workout in our home gym while Skipper snoozed on his favorite pillow bed. Shhhh, don’t tell him it’s pink! I got it super cheap on clearance and didn’t care that it’s ugly since it just stays in the gym. 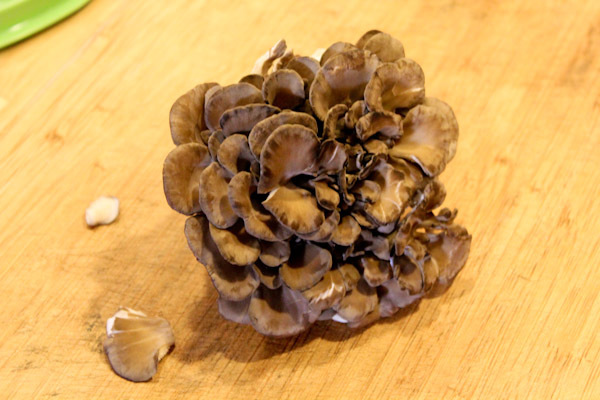 We got a farm box this week and in it came this very interesting looking maitake mushroom. Turns out it might be a good cancer fighting food. I hated mushrooms growing up, the smell and slimy texture invoked my gag reflex because we used a lot of cheap canned mushrooms which is not a good way to introduce them to a kid! It wasn’t until I went vegan and started trying more exotic veggies that I discovered the good, fresh mushrooms actually taste good and not like stinky, slimy, wet sponges. 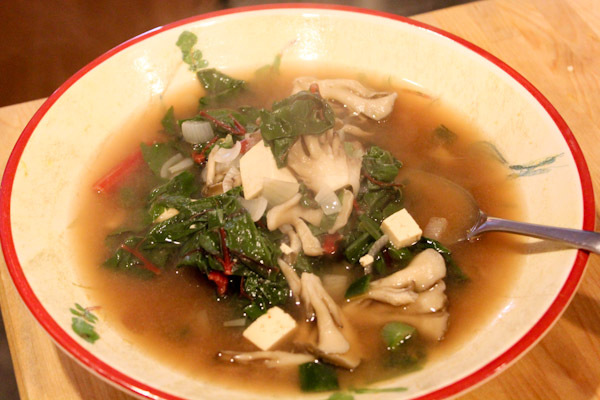 My favorite recipe to use them in is a simple miso soup ever since our little Napa getaway, so I chopped this bunch up and added them to this miso soup recipe along with high-protein tofu, chopped chard, and chopped green onions. 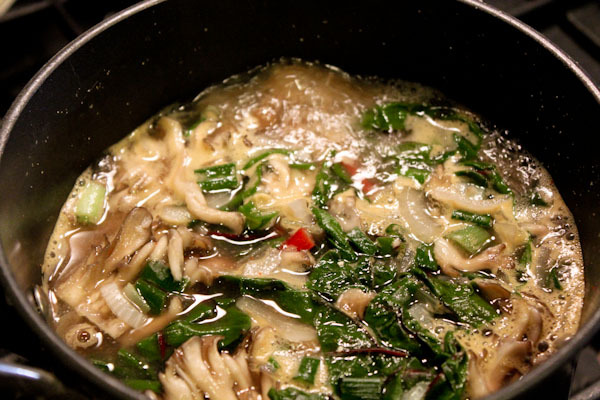 The maitake mushrooms have a nicely hearty and firm texture even after being cooked, they weren’t slimy or mushy, and added a wonderful flavor to the soup. My husband loves super hero movies… well I kind of do too! 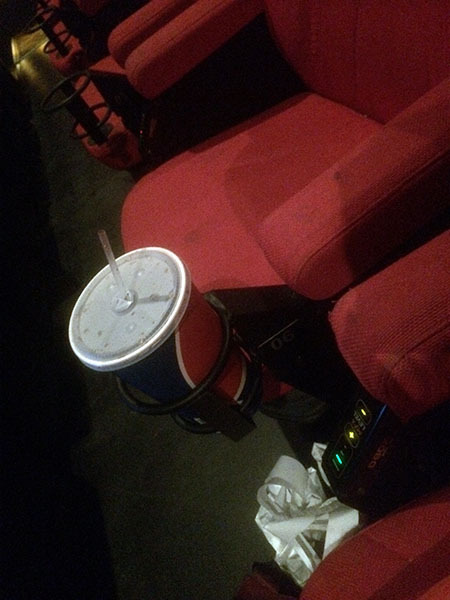 So it was perfect that Captain America: The Winter Soldier opened on his birthday weekend. We ventured to Folsom yesterday to see it not only in 3D, but in D-BOX seats at the Palladio 16 theaters. They’re high tech seats that add sound and motion to the movie experience and this was our first time trying it. At first it seemed like the sound and motion was too much and too distracting in the beginning of the movie, but I quickly adjusted and got into it. The seats add bass and move and rock with the motion and really enhanced the action scenes and made the flying and falling scenes more fun. At about $17 per movie, it’s not cheap, but not a bad deal when you think of it as a 2-hour long massage and amusement park ride as well! 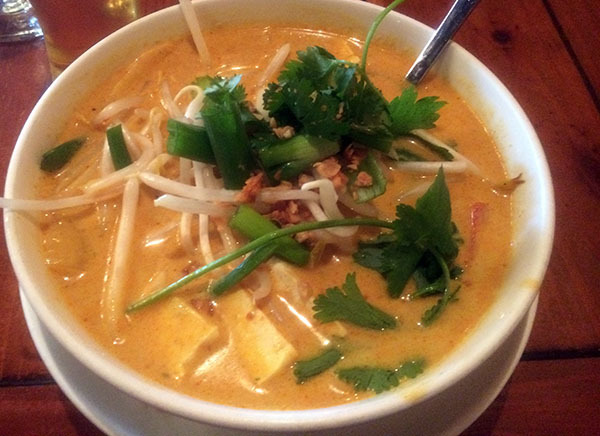 After we headed to Thai Paradise for dinner where I got this wonderfully spicy tofu curry noodle dish. It was perfectly spicy for me, no need to add more. And the curry was nicely creamy with coconut milk. Today we have more fun planned and a family party tomorrow and it’s all great, so lucky I get to celebrate it with him and make it a special weekend! And thankful the chilly rain moved on and it’s sunny and warm this weekend! Lol, thanks! Things get a little random sometimes. :-) Thanks on hubby, it was a great weekend with a lot of fun for him. Yes, the movie was great! I liked it better than the first one and worth seeing in 3D.